Also known as the "Guedel" airway, the oropharyngeal airway tube is a simple adjunct which bypasses the oropharynx and allows air (oxygen, sedating gas, etc) to bypass the tongue and upper pharynx. The use of this device is reserved for the incompletely conscious, as its insertion into the face of an alert person is usually greeted with violent confrontation. As such, one can usefully gauge the need for intubation by the degree to which this thing is tolerated (i.e. if it is well tolerated, then by definition the patient is not protecting their airway). Essentially, this rigid tube offers a bite-resistant passage for air from the lips to the posterior pharynx. The curved portion rests between the posterior pharyngeal wall and the tongue, keeping the epiglottis off the posterior pharyngeal wall (where it would normally be forced into by the flaccid collapse of the tongue). Awake patient: An awake patient will not tolerate this airway, as it will stimulate their gag reflex. 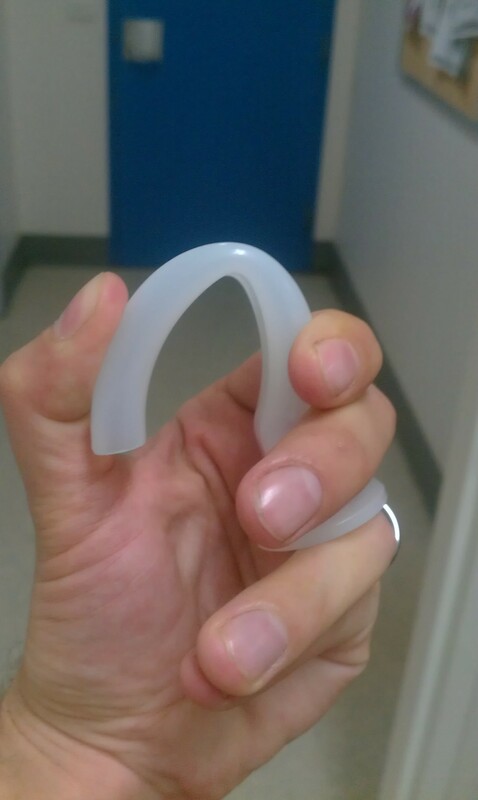 Severe coagulopathy: this device, although possessing rounded edges, is still made of very hard plastic and it can still cause lacerations to the oral mucosa. If you have no platelets, you may end up with a lung full of blood from some sort of little posterior pharyngeal bleeder before anybody notices. The tube is sized by placing it vertically, with the flange in the middle of the lips and the tip emerging at the angle of the mandible. In adults it is inserted into the mouth upside-down, and rotated into the normal position once it is inserted about half way. Lubricant may be useful if the mouth is excessively dry. Available as a sterile product for single use; though most of the time the packaging is non-sterile (it tends to be cheaper that way, and one might make the argument that the oropharynx is not a sterile field anyway). Damage to teeth, particularly if the patient bites down forcibly on the bite block. Failure of airflow due to an inappropriately small tube pushing the tongue into the posterior pharynx, or an inappropriately large tube pushing the epiglottis down into the trachea. Airway obstruction may result even from the use of an appropriately sized airway. Marsh et al (1991) reported on a case series of 22 patients in whom lateral neck Xrays were performed after Guedel insertion; in several the airway was either obstructed by the epiglottis or slipped into the vallecula. Weirdly, a radiologically malpositioned airway was not always associated with any clinical evidence of obstruction. This airway was actually first developed by Arthur Ernest Guedel (1883–1956). The very same Guedel also proposed a system to classify the stages of anesthesia, which has been retained in classical anaesthetic training in spite of the fact that most modern agents will drop you within seconds, and nowadays the stages all blend into one. But I digress. The early oropharyngeal airways were already flanged, but in 1933 they were made of hard metal, which (very likely) chipped and loosened many rotten post-Depression era teeth. Guedel's great advance was making them from rubber, which was a massive improvement over the cruel-looking all-metal Connell airway. The best resource for this device, as always, is the site of the manufacturer. Unfortunately there is about a thousand manufacturers of these airways, or similar airways. All the products share the same features, mostly. Guedel, Arthur E. "A nontraumatic pharyngeal airway." Journal of the American Medical Association 100.23 (1933): 1862-1862. Marsh, A. M., et al. "Airway obstruction associated with the use of the Guedel airway." British journal of anaesthesia 67.5 (1991): 517-523.